Yesterday, after finishing up a Wintergrasp victory, I saw a team forming for 25-man Vault of Archavon. I had done the 10-man earlier in the week, so I figured I could easily do 25-man if we got a good team together. I joined in, waited about 20-30 minutes while they put the rest of the team together, and we took off. On the single-target trash leading up to Archavon, I averaged 3300 DPS - it's amazing what a full raid group will do for your DPS. Then we got to the boss. It took a bit for the fight to be explained (which I mostly ignored since I knew my job - DPS). And we took off. We had a wipe due to lack of DPS (we were 2 men down) and some other people just couldn't be bothered to watch out for the dust clouds. So we quickly regrouped and tried again. This time, success. 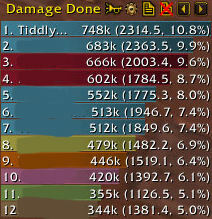 On both attempts, I led the DPS charts and was always in the right position and never needed emergency heals. 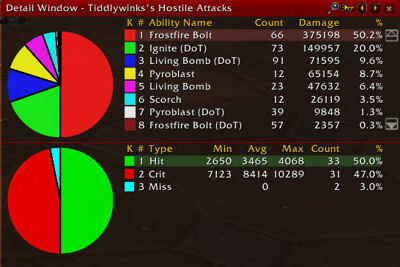 And finally, a breakdown of my damage on the fight. Note: I missed 2 Frostfire Bolts. 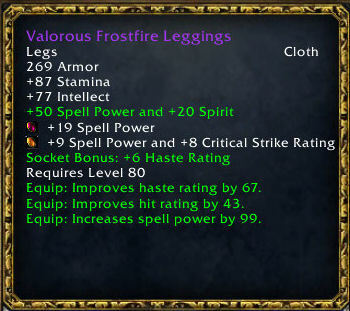 Luckily the new pants have 43 hit rating on them, so that should help. I'm also carrying around some old shoes with extra hit that I should use on bosses, but I usually forget to do so.